Another Tablet in which Bahá'u'lláh proclaims some of His basic teachings is the Kalimát-i-Firdawsíyyih (Words of Paradise). * This Tablet was revealed about two years before His ascension in honour of His trusted disciple Hájí Mírzá Haydar-'Alí. Bahá'u'lláh's exhortations and counsels in this Tablet are no less soul-stirring and significant than those in His other Tablets mentioned previously in this book. * A full translation of this Tablet is published in Tablets of Bahá'u'lláh, pp. 57-80. † For a further discussion on this subject see above pp. 27-8. ‡ see above, pp. 125-39.
and tranquillity of all mankind'; declares that 'this span of earth is but one homeland and one habitation'; asserts that the 'basis of world order hath been firmly established upon reward and punishment';* warns that the world's corruptions, so deeply rooted, cannot be purged 'unless the peoples of the world unite in pursuit of one common aim and embrace one universal faith'; advocates that 'schools must first train the children in the principles of religion';† urges the establishment of a universal language; and states that 'in all matters moderation is desirable', explaining that 'if a thing is carried to excess, it will prove a source of evil'. Most of these teachings extracted from the Kalimát-i-Firdawsíyyih have already been mentioned in other Tablets and quoted in more detail in this book. In this Tablet Bahá'u'lláh authorizes the members of the Universal House of Justice 'to take counsel together regarding those things which have not been outwardly revealed in the Book', and commands them 'to ensure the protection and safeguarding of men, women and children'. * For an explanation of the need for punishment see vol. 3, pp. 294-7. † see vol. 3, pp. 326-331. ‡ see vol. 2, pp. 34-7, and above, pp. 162-3. § see vol. 2, pp. 24-8. 1. Tablets of Bahá'u'lláh, p. 64. Although man is unworthy, he can nevertheless become an embodiment of heavenly attributes once he attires himself with the vesture of faith. For it is through having faith and believing in the manifestation of God for this age that the individual becomes the recipient of divine assistance from on high. 2. Long Obligatory Prayer, Prayers and Meditations no. 183. 3. Quoted by May Maxwell, An Early Pilgrimage, p. 40. * see vol. 1, p. 35. 4. Tablets of Bahá'u'lláh, pp. 61-2. 6. Unpublished compilation, National Archives Committee, no. 28, p. 292.
and heaven. In another Tablet He testifies that if the divines and men of learning were able to be in His presence* when revelation of the Word of God takes place, they would be so influenced as to be left with no other choice but to acknowledge the truth of His Cause. To another believer, Bahá'u'lláh intimates in a Tablet7 that if he were present at the time of revelation he would be so exhilarated that his soul would take its flight into the realms of the spirit which are hidden from the eyes of men. In one of His Tablets8 Bahá'u'lláh discloses the intensity with which the verses of God have been sent down in this Dispensation. From the tone of this Tablet is appears that it was revealed towards the end of His earthly life. In it He states that His amanuensis, Mírzá Áqá Ján, used to take down the verses of God which were revealed continuously from morning till evening. He describes how in earlier days He had been engaged in revealing the Words during both day and night, and would only interrupt His utterances in order to attend to other matters. In those days, He affirms, the Tongue of Grandeur was continually revealing the verses of God. But now, at the time of revealing this Tablet, He intimates that owing to physical weakness He has had to bring His utterances to a close after one hour of revelation. But whenever He resumes, all the members of His body will be activated and the verses of God will transform His whole Being. This condition of physical weakness Bahá'u'lláh attributes to the sufferings inflicted on Him by the people of tyranny. They have been the cause of the withholding of the further diffusion of divine fragrances among mankind. But he assures the recipient of this Tablet that until His spirit takes its flight to His other Dominions, the Tongue of Grandeur shall continue to speak and the Pen of the Most High move upon His Tablets. * For further information see vol. 2, p. 254. 7. Áthár-i-Qalam-i-A'lá, vol. 5, p. 63. 8. ibid. vol. 1, p. 309. 9. Tablets of Bahá'u'lláh, pp. 74-5. The sage of Sabzivár hath said: 'Alas! Attentive ears are lacking, otherwise the whisperings of the Sinaic Bush could be heard from every tree.' In a Tablet to a man of wisdom who had made enquiry as to the meaning of Elementary Reality, We addressed this famous sage in these words: 'If this saying is truly thine, how is it that thou hast failed to hearken unto the Call which the Tree of Man hath raised from the loftiest heights of the world? If thou didst hear the Call yet fear and the desire to preserve thy life prompted thee to remain heedless to it, thou art such a person as hath never been nor is worthy of mention; if thou hast not heard it, then thou are bereft of the sense of hearing.' In brief, such men are they whose words are the pride of the world, and whose deeds are the shame of the nations. 11. Tablets of Bahá'u'lláh, pp. 75-6. 'Prince of the City of Statesmanship and Literary Accomplishment'. He was a contemporary of Bahá'u'lláh's father and a faithful friend of his, highly acclaimed at the court of Fath-'Alí Sháh* for his wisdom, uprightness, benevolence, courage and dignity as well as his learning and knowledge. He was a highly gifted writer whose compositions are considered to be among the best in the literary field. As a statesman he was very capable; 'Abdu'l-Bahá has described him as foremost in the whole of Persia. He became Prime Minister in 1821 and continued to hold this position until the reign of Muhammad Sháh (1834-48). In a country where injustice and corruption were rife he upheld standards of justice and honesty. As a result his enemies conspired against him, poisoned the mind of the monarch and made him believe that his Prime Minister was about to overthrow him. These falsehoods gained credibility and Muhammad Sháh became filled with fear. In 1835 Qá'im-Maqám was executed in Tihrán by his orders. In the Writings of Bahá'u'lláh one can hardly find a word of praise directed at any of the authorities in Persia. The tribute He has paid to Qá'im-Maqám is unique, and indicative of the greatness of this man. Bahá'u'lláh finds that no actions on the part of Muhammad Sháh were more heinous than the banishment of the Báb to the fortress of Máh-Kú and the murder of Qá'im-Maqám. † see above, pp. 185-6. Asadu'lláh to his home knowing that he was a Bahá'í teacher. At that time Mírzá Áqá Khán was a youth and an enthusiastic Muslim. He became highly indignant that his father was entertaining a Bahá'í in the house, and decided to put an end to it. 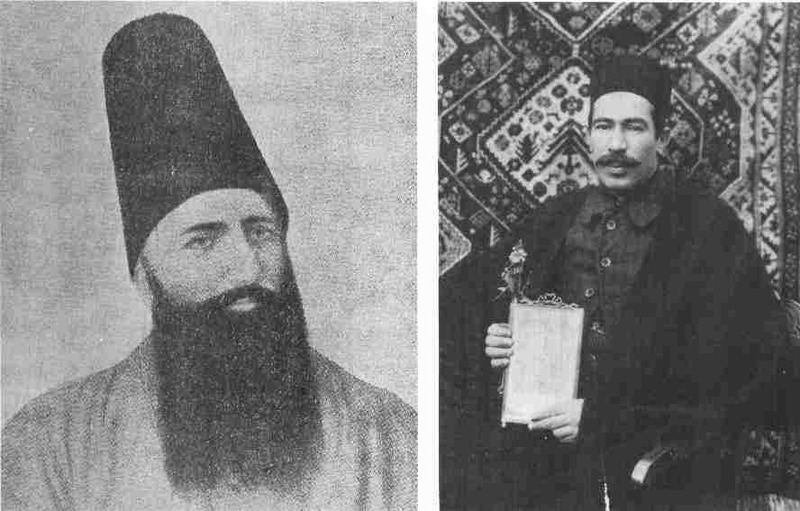 Believing that he would win the good-pleasure of God if he killed a Bahá'í, he proceeded to attack Siyyid Asadu'lláh, but the latter through his charm and loving personality succeeded in calming him down. Soon in that same house Mírzá Áqá Khán found himself sitting spellbound at the feet of Siyyid Asadu'lláh, listening to his words as he produced proofs of the authenticity of the station of Bahá'u'lláh. So profound and convincing were his arguments and so radiant his spirit that Mírzá Áqá Khán and his cousin both became ardent believers. As time went by Mírzá Áqá Khán became a truly outstanding Bahá'í. To the nobility and courage of his character was now added the power of faith. He arose to serve the Cause with a zeal and devotion which few among his contemporaries could match. At first he began to earn a modest living and became independent of his father's wealth, but soon he was faced with serious financial difficulties. Then he had a dream: Bahá'u'lláh appeared to him, pointed to a hill nearby, and directed him to dig out some valuable relics which were buried on the side of the hill. Believing his dream to be true, Mírzá Áqá Khán carried out the excavation and recovered a great quantity of priceless relics and jewels. He thus became one of the richest men in Arák and the most influential of its residents. Throughout his long years of life he used his enormous wealth and influence to further the interests of the Cause he loved and served so well. Although he was wealthy, he lived a very simple life. He was a tower of strength for the believers and a guide and refuge for the downtrodden and the needy. His generosity, magnanimity and care for the welfare of people earned him the love and respect of the public in general and the Bahá'ís in particular. the people, a bearer of the standard of the Kingdom and a manifestation of the bounties of heaven. In a previous volume* there is a reference to the words of Bahá'u'lláh concerning the discovery of alchemy, the transmutation of elements, which He links with the coming of a great calamity for the whole world. It is known that the transmutation of elements is now possible through certain nuclear processes. The following passage in the Kalimát-i-Firdawsíyyih needs some explanation. In many Tablets revealed during the latter part of His Ministry Bahá'u'lláh describes to some of His faithful disciples the anguish of His heart because of the misdeeds of a few of His so-called followers who had joined hands with the supporters of Mírzá Yahyá in Constantinople in attempting to dishonour the good name of the Faith and its Author. This distressing episode brought great sorrow to Bahá'u'lláh towards the end of His earthly life. * see vol. 2, p. 268. 14. Tablets of Bahá'u'lláh, p. 69. 15. Quoted by Lady Blomfield, The Chosen Highway, p. 184. [transmutation of elements]: The Kitáb-i-Aqdas Note 194; The Kitáb-i-Íqán p. 157; The Revelation of Bahá'u'lláh, vol. 1 p. 86, vol. 2 p. 268. The 'one known individual' mentioned above is a certain Muhammad-'Alíy-i-Isfahání, not to be confused with Siyyid Muhammad-i-Isfahání, the Anti-Christ of Bahá'u'lláh's Revelation. A brief account of this episode is given in Chapter 25. 16. Tablets of Bahá'u'lláh, pp. 59-60.